I appreciate rich, dark chocolate much more this time of the year for some reason. Maybe because it is kind of like sweet comfort food, or because Valentine's Day is just around the corner so I feel like chocolate is in order, but whatever the reason, I find myself enjoying it more lately. Mostly just dark chocolate candy, but I bought a big block of unsweetened chocolate for baking, and decided that making a flourless chocolate cake was a good idea. I figured it would be something that other people might want to make for Valentine's day, it sounded good to me at the time, and I knew Eric would love it since he is the biggest chocolate lover I know, so I went for it! I haven't made a flourless chocolate cake in a few years, so it was about time! I wanted this one to include hazelnut too though along with the chocolate because those two flavors are amazing together. I had some hazelnut meal and hazelnut butter on hand so it was perfect! Flourless chocolate cake is kind of odd compared to other cakes. It is mostly just chocolate and eggs if not vegan so I used flax eggs in mine and they work perfectly! 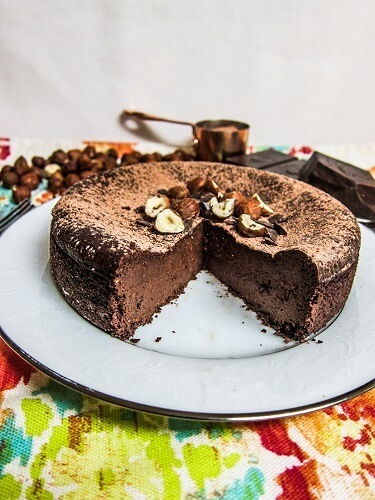 This cake has 4 oz of unsweetened chocolate plus cacao powder so it is intensely chocolaty. I tasted some of the unsweetened chocolate as I was chopping it up for the cake and surprisingly I liked it. It was like savory chocolate! Once it was all melted together with the coconut sugar, hazelnuts and meal and flax eggs it tasted like brownie batter! It smelled amazing while baking! My house filled with the heavenly aroma of dark chocolate. I could not wait to try the cake! Luckily you don't have to wait long for this one to cool, it is best served warm after all. It was amazing. Like a super decadent rich brownie. A small piece would satisfy, but of course I had to cut myself a large one. 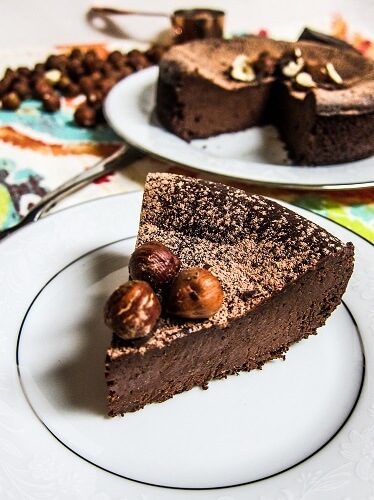 If you wanted to tone down the dark chocolate or make this even more decadent you could serve it with coconut whipped cream, or ice cream as well! In a bowl, whisk together the flax seed and water. Place in the fridge for 15 minutes to gel. This will be your flax eggs. Meanwhile, oil a 6 inch spring form pan with coconut oil and preheat the oven to 375F degrees. In the top of a double boiler, combine the chocolate and nut butter. Allow to melt, whisking often. Whisk in the pear puree, sugar, sea salt, and vanilla until smooth. Add the flax eggs and allow to warm for a couple minutes with the other ingredients whisking often until completely smooth and uniform. Whisk in the cacao powder until very well combined (you want to make sure the oil is emulsified in or it will separate when baking). Place in the oven and bake for about 30 minutes until dried on the top and mostly set. 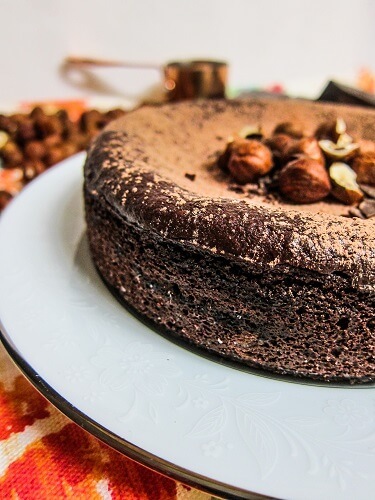 Once finished baking, remove from the oven, allow to cool 15 minutes, then release from the pan and dust with cacao powder. 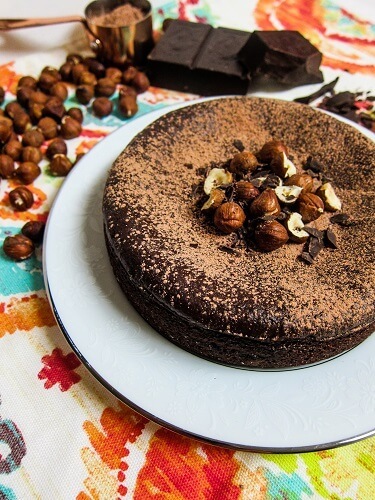 Garnish with hazelnuts and chopped dark chocolate and serve! 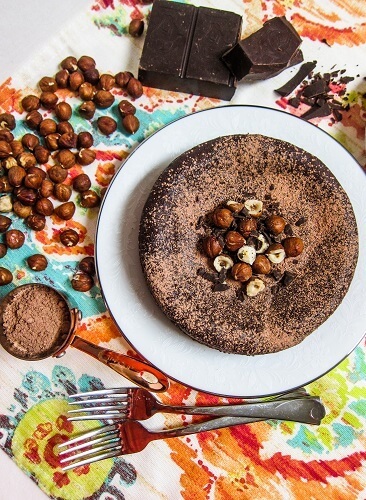 *To make the hazelnut meal, grind whole hazelnuts in the blender until flour consistency, but not too long or you will get butter. Or you can buy Bob's Red Mill brand hazelnut meal on Amazon or Vitacost. 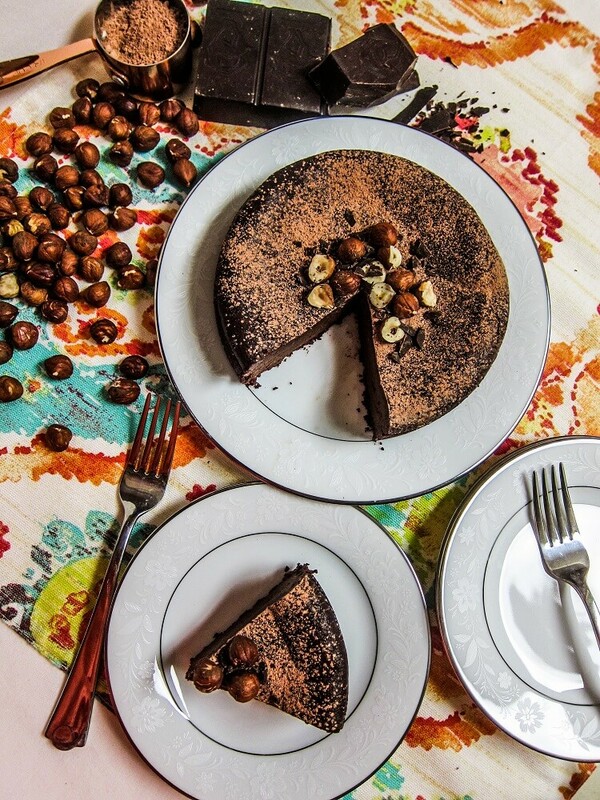 Years ago before going vegan I made a flourless hazelnut cake from a recipe in Gourmet magazine that blew my mind. I am so grateful to see this decadent an enticing recipe. I can't wait too try it! Thanks Hanne :)! I do hope you try it :)! Thank you :)! I am always happy to share!